Design an ideal getaway, up where the air is clear! Living way up in the clouds is a dream many of us fantasize about on a daily basis; high above the hustle and bustle of the streets below, a secluded, private and beautifully constructed skyward sanctuary might seem like the reserve of the financial elite. This however, is not the case, as more and more urban homes are built on the 100th floor, and the more extravagant country dwellings are expanding their first and second floors with extra rooms, balconies and rooftop terraces, the idea is becoming much more common than you may have realized! 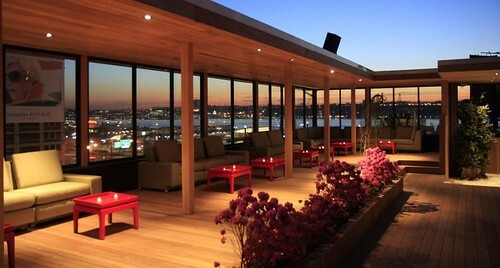 One common issue that arises even after the space is available, is the preconception of the cost, time and effort it would take to completely transform an old, dirty and unkempt rooftop into somewhere truly beautiful, that you would yearn to spend time in. For preconception however, you might as well read misconception, as not only are many of the elements required available at a great price, with a bit of planning and resourcefulness, you can renovate such a space with relative ease, for truly incomparable reward. 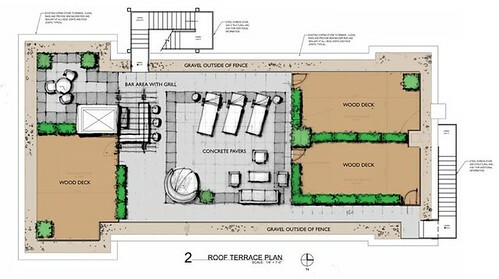 Here then are our top tips when considering roof terrace design. Of course, clearing out should be your first task. Getting rid of all the old junk and making sure the floor space is as flat and even as possible. The nature of the space often means that there may be some immovable systems or wires in the way, and we don’t want to sacrifice the entire building’s air conditioning or electricity for the sake of an even floor, so pay attention to these obstacles and try to play furniture around them. A flooring solution should take care of any wires or fixtures there. A rooftop terrace should feel homely and luxurious, so whilst paving is still an option, one of the most popular alternatives is to use composite synthetic decking. The many colours available means you can create just the right atmosphere, whether that’s through deep, dark-stained wood or a breezy beech effect. Many are anti-slip and extremely versatile as far as installation is concerned, making your life all the easier! Best of all, they look absolutely stunning and help to punctuate the luxury aesthetic! Garden furniture, naturally, will work well on a rooftop terrace, although further than mere deck style chairs and tables, a large, cushioned Rattan sofa offering or an integrated wood seating solution will help define it, again adding the luxury characteristic to your space and making it a nicer place to be. Experiment with what works and remember the larger pieces will take up more room but keep you comfortable! Now things begin to get really interesting. Considering plants, water features and anything thing else you may wish to adorn your relaxing retreat with gives you the perfect opportunity to really experiment; planters, lining hedges and general greenery are an essential for your terrace and you can create some really interesting focal points utilizing water. One great example is the use a large sheet of reflective glass that doubles as a water wall. 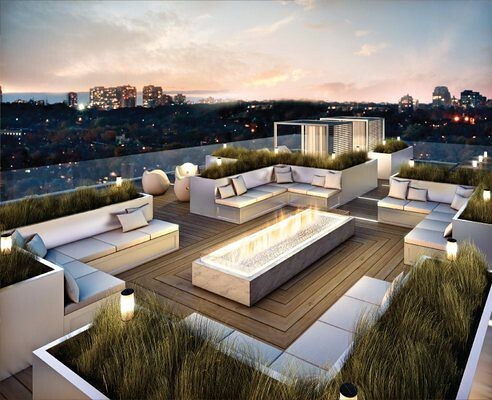 It gives the impression of a larger space whilst simultaneously being a feature piece of the rooftop! The lighting is the finishing touch, and can really make all the difference in the evenings. If you’ve gone for some fancy water or plant features, consider the options for lighting them ambiently, uplighters and in-decking lighting also help to create a beautiful looking, serene night-time atmosphere. 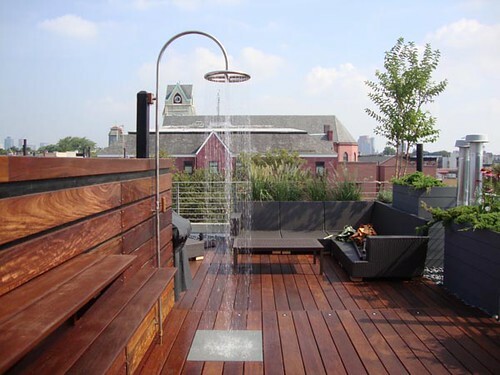 Ultimately, a rooftop terrace that you may once have considered so far out of reach it might as well be situated on the moon is actually much easier to create and, following these tips, you’ll end up with a stunning little personal hideaway in no time. Give it a try! This article was written by Rob Vicars on behalf of Raaft. For composite PVC decking that will provide the perfect rooftop terrace flooring or work brilliantly in any domestic or commercial capacity, you need look no further than Raaft!